Aldi may have me drowning in Pumpkin products, but their Halloween-specific goodies were pretty slim pickin's. I picked up some more of the Halloween Pasta (which makes an amazingly spooky pasta salad perfect for lunch boxes) and some fruit snacks, but other than that it was mostly bags of name brand candy and treats. 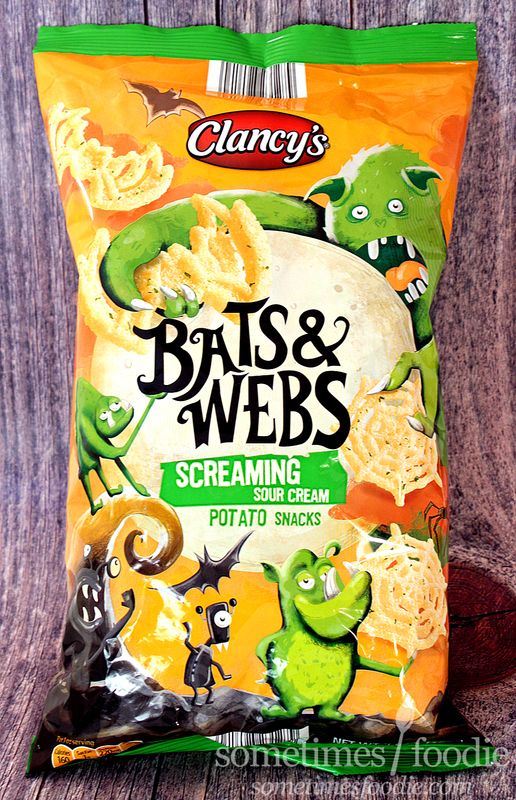 When I spotted these fun spider and bat themed snacks tossing them into my cart was a no-brainer. This is a Clancy's branded item, and normally Clancy's is the store-brand-iest of the Aldi store-brands. Their bag designs are usually boring and straight forward, but this one is covered in bells and whistles! We're got faux texturing, whimsical characters, spooky shapes and bright colors. The oil pastel-texturing on the characters was a particularly nice touch. Aldi's design team just keeps getting better and better, but are the snacks inside just as impressive? I opened up the bag and it was a jumbled mess of bats and spiderwebs, but in a good way. 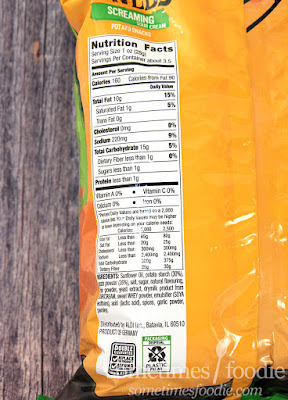 The snacks are really light weight and crispy, similar to Shrimp Chips or Bugles, and they smell like sour cream and onion seasoning. Look at these shapes! 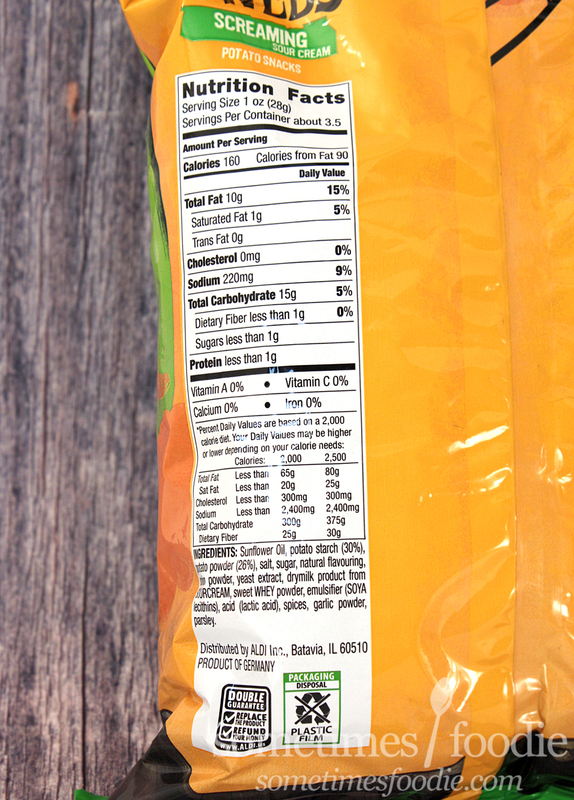 They're so delicate, and yet they're sturdy enough to get tossed around in this bag without breaking. I really thought I was going to open this up and find nothing but a broken crumbled mess, but all these shapes are pretty much intact! I tossed a spider web into my mouth and the flavoring immediately reminded me of my childhood. Back in the 90's my family was really into Bugles. We'd buy them in all kinds of flavors, but the ones I remember the most vividly are the sour cream and onion. 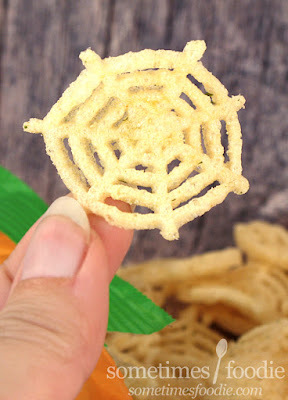 I may not be able to wear these webs as fake witch-y fingernails, but these snacks taste are particularly identical to the cone-shaped snacks of my youth. Then there's the adorable bat shapes! 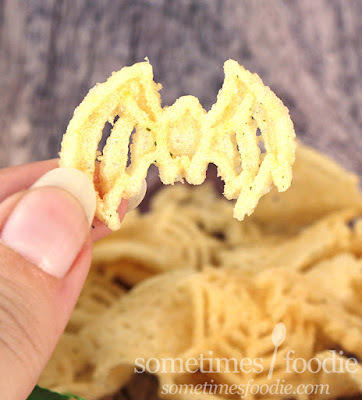 All the shapes taste the same, but the bats are my favorite because of how detailed they are. If you like light and crispy snacks, like Bugles, these are a seasonal must-have! I am really impressed with these and I hope they return next year because I'll definitely be stocking up so my snack drawer can be spooky year-round!